As mentioned in Tip #23, we were not as prepared as usual for our recent 11-hour road trip to Oregon, nor did we have the benefit of fair weather as we do in summer, when usually make this trek. 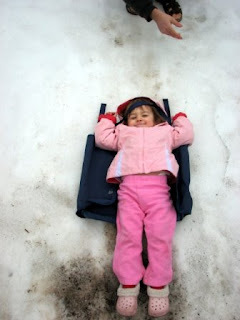 By the time we were half-way home again, the girls voted unanimously (and animatedly) that they were done with the car and, of course, with their car seats. With some 5 or 6 hours still to go, we had to come up with something new and wildly different from the menagerie of toys now flung all over the car and repertoire of road songs we’d grown almost hoarse from singing. The frigid rest areas where even dogs scarcely stepped outside of their vehicles held little entertainment value for any of us at this point. We had to think of something else, and fast. Although Tim and I grew up with flurries of the stuff, it’s something we certainly never get at our home in California–except on T.V. They kids could hardly contain their excitement as they reached out to see just how cold it was. Making the most of this unlikely roadside stop that we could, Tim devised an impromptu sled out of one of our car seat travel trays, and we whooped and howled like deranged coyotes as we slid down this less-than-picturesque hillside, trying to avoid the mud puddles below. In under 15 minutes, the girls had exhausted themselves from the laughter alone, and they were beginning to feel cold enough to actually welcome a return to the warm car–and even their car seats. A mere fifteen minutes out of the car and not a nickel spent, yet we were all the better for it–and have a very fun memory. It was a good reminder of why I like to travel with my children. The simplest things we take for granted in our grown-up travels (like expired snow on the roadside in this case, pigeons or airport “people movers” in others) can be such a source of joy and wonder to small children. 1. In unfamiliar towns: Hit the local library to use its restrooms, drinking fountain, and enjoy a storybook (or a few if there’s time) in the children’s section before climbing back into the car. 2. At scenic turnouts: Have a picnic or snack outside of the car, using your ice chest and stroller or blankets for seating (or keep your lawn chairs handy if you’ve brought them along). 3. At rest areas: Bring an inflatable beach ball or rubber ball to chase around the lawns of roadside rest areas. We’ll always have a warm, fuzzy spot in our hearts for Dunsmuir, California–and our handy travel tray.